Usually harvests in mid-to-late July and stores all through winter at room temp. Grows great in most locales but the further south you get the more difficult they are to grow and forget about growing them in the deep south. 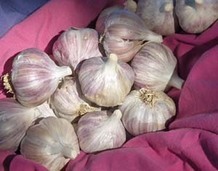 Russian Giant is a Marbled Purple Stripe garlic with a rich, musky, garlicky flavor and is very hot when eaten raw. It can get really big when well grown and it has all the depth of flavor and long storage that Marbled Purple Stripe garlics are famed for, not to mention some of the largest bulbils of any garlic to speed up production since the bulbils can be eaten or planted. 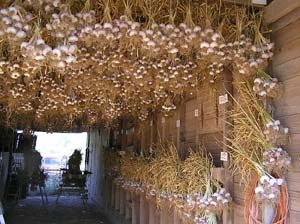 Russian Giant garlics have brownish-purplish bulb wrappers and easy to peel brownish clove covers and some of the largest cloves of all garlics. There is an average of only five cloves per bulb but they are HUGE cloves of very flavorful garlic. They have thick, wide deep green leaves with a bluish hue. Marbled Purple Stripes are valued for being robust full flavored garlics that you can enjoy all through the winter and into the spring. Russian Giant's cloves are all of similar large size with no small cloves. You'll be glad you grew these garlics. Mouseover their pictures to see their contact info - click on their pictures to buy.